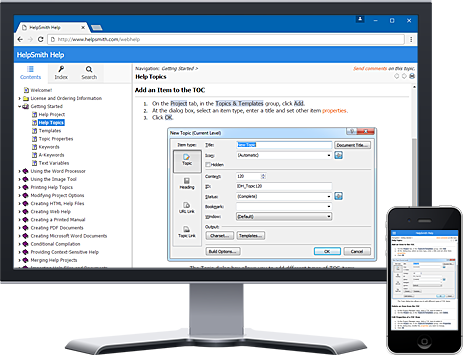 With HelpSmith 7.0, you can now create a Web Help system that can be viewed both on desktop computers and on mobile devices such as tablets and smartphones. Thanks to the fully responsive layout, when a user is viewing a Web Help system from a mobile device, it automatically adapts to the device’s screen size and provides maximum usability. In addition, if you use large images in your help project, you can define which images should be scaled to the page width in Web Help when the help system is viewed on a mobile device. The new HelpSmith version now automatically generates a Google Sitemap file for your Web Help system that provides better indexing and ranking of the whole help system in Google’s search results. Also, you can now easily integrate your Web Help system with Google Analytics service to get reports of your user audiences and traffic sources. All you need to do for the integration is to specify your Google Analytics tracking ID in Web Help settings in HelpSmith. 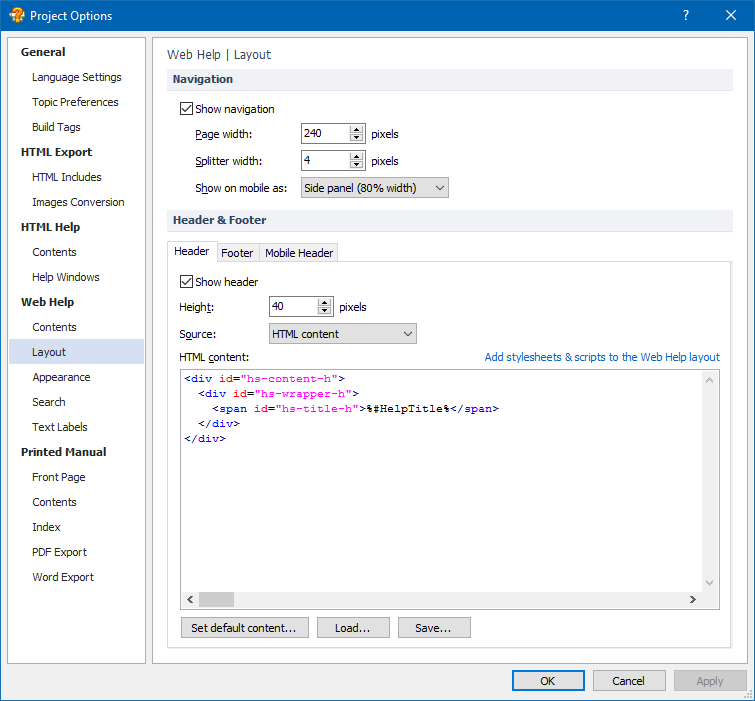 Now you can customize the HTML code of the Header, Footer, and Mobile Header areas of the Web Help layout directly in HelpSmith. 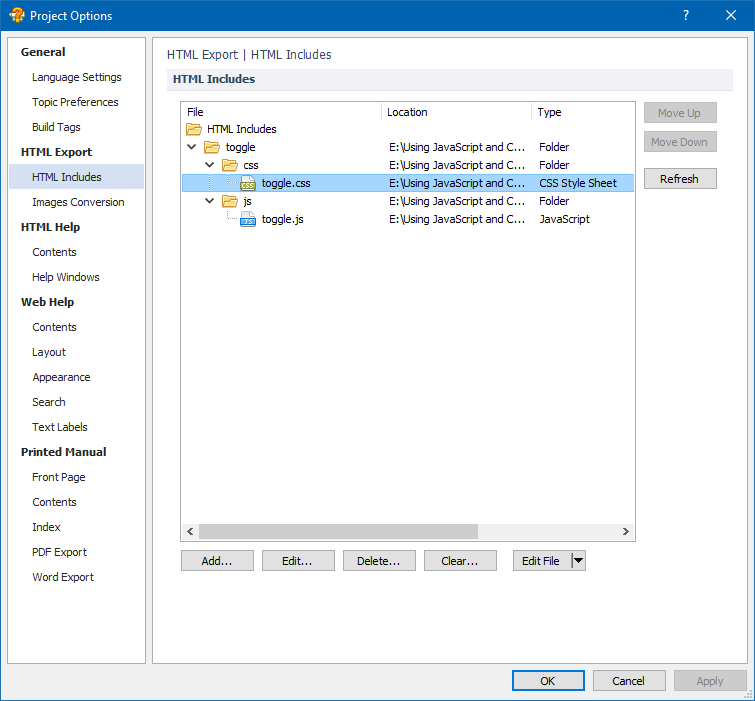 This possibility enhances the options that existed in previous HelpSmith versions that allowed you to use a special help topic or an external URL as the content source of the Header or Footer area. In addition, the redesigned Web Help system allows you to change the styles of tabs in the navigation page, select the preferred style of plus/minus icons in the Table of Contents, and customize the TOC icons using 16×16 or 20×20 pixels images. Finally, we have added additional Web Help appearance options such as mobile header settings, the possibility to use a background image for the header/footer and mobile header areas, the possibility to customize the navigation pane’s splitter, the possibility to modify the border radius of tabs, and the possibility to modify the search button. In this update, we’ve also redesigned the HelpSmith’s ribbon-based user interface to follow up-to-date standards and make working with the application as comfortable as possible. Improved Search functionality in Web Help: topic titles are now indexed and ranked in search results properly. Using text variables in HTML code is now supported. Reworked the Edit HTML Code dialog that is used to insert HTML code into a help topic or topic template. Added a word-wrap option for long titles in the Table of Contents in Web Help. Added the possibility to disable the navigation pane in Web Help. Some dialogs were not displayed correctly when using the “large fonts” mode in Windows.